In Iceland we don’t have just one Santa Claus with a nice beard, dressed in red. Nope, we have thirteen troll like creatures, Yule Lads. They are not the nicest chaps either, really mischievous and bear names like Window Peeper, Stubbs and Meet Hook. However, kids wait eagerly for their visits this time a year. Each evening in the 13 days before Christmas, Icelandic children place their shoe in the window. If they’ve been good the Yule Lad of the day will put a small present or a candy in their shoe. But, if they’ve been naughty all they get is a raw and preferably rotten potato. You can read more about the Yule Lads and their horrific parents, Grýla and Leppalúði on the homepage of The National Museum of Iceland. 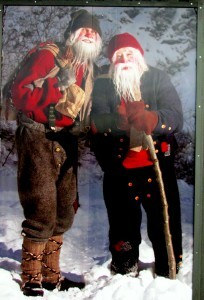 Yule Lads in Dimmuborgir, North Iceland.